This is the game that made me want to become an indie developer. This is the game that made me start looking up how to make games myself instead of relying on school to do it for me. This is the game that showed me that it's possible for a small group of fans to get together and produce a work with professional quality. This is the form off creative brony work that showed me just how powerful mixing my two favorite things in the world could be. This is a post about Fighting is Magic. What started off as a joke turned into what I call the absolute best fan game ever created. The amount of polish, love, and creativity that went into this thing is off the charts. The development team known as Mane6 posted several livestreams of their progress with the game and I watched every single one countless times. I couldn't shake the feeling of excitement. Watching a group of friends combine their talents like this made me think hard about what I want out of life. It was clear that I wanted this. I want to make whatever crazy passion project pops into my head with a small bunch of other people who are doing the same. Back then I just figured my biggest dream would be a 6 digit salary and an important programming role somewhere (hopefully Retro Studios). After this my dreams got much bigger. I just knew I wanted to make games as I thought them up. I waned to evolve ideas with a team where each member had a specialty. The fun part would be making the idea come to life, and the money would come because there will be others out there who wanted to play it as much as we did. The attention to detail is what makes this stand out. 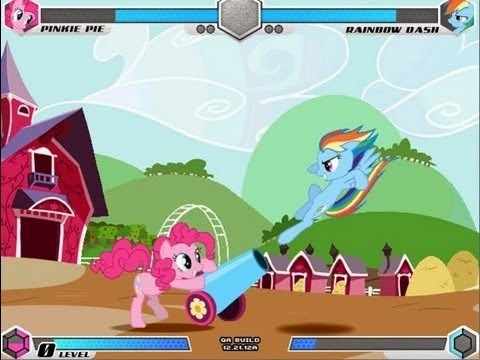 Not only is it born from a love of the MLP reboot, but it's also a product of the fighting game community. Mane6 is composed of fighting game fans who know what makes a good fighter. The Marvel vs Capcom style action needs to be seen to be appreciated. This is the kind of game that unites fans of completely different things. People who never played competitive fighting games before are willing to give them a try thanks to this. People who didn't know about this pony phenomenon become interested in the show because this introduces the characters in a way they understand. It's all about combining the unfamiliar with something important to the audience to get people to try new things. Most impressive of all was the polished presentation. this was the first time I saw a fan game that looked like it could stand on it's own next to Castle Crashers on XBox Live. Naive young me pictured Hasbro seeing it and paying the developers to release it on multiple platforms for them. Sadly something quite opposite was true. The developers were hit with a Cease and Desist letter after the game was shown at Evo. The game looked so professional that Hasbro had to take action or risked losing their IP. Fighting is Magic was able to raise a lot of money for charity and also displayed the My Little Pony characters performing cartoon violence on each other (nothing worse than what's in the actual show in my opinion). The developers didn't fall too far though. Soon after cancelling the game the show's creator Lauren Faust, who no longer works on it, offered to create new original characters to replace the ponies. The devs accepted and started work on a new but similar project, a fighting game featuring quadrupeds running on the Z-Engine. Courtesy of the Skull Girls developers because of Mane6's help with their IndieGoGo campaign. Even without the ponies I eagerly await Mane6's first finished game. I keep up with their development blog (which inspired this one) and pledge myself as a long-term fan. This team triggered the fire that burns inside me and compels me to make games on my terms and not anyone else's. They proved to me that with enough pure talent, a game with outstanding quality can be made with part-time hours and a budget of zero. I will never forget this game. This is the project that started it all. The spark I needed to motivate myself. This is the game that inspired me to learn how to make games, just so I could work on a game that felt like it. Now I finally am. If anyone at Mane6 is reading this, thank you. Yotes Games is here because of you.